Holly's recap of the 2016 Vermont City Marathon and video. I picked the Vermont City Marathon for Vermont because it has quite the reputation for being a very well run race and the spectator support is outstanding. One of those statements is true, the other not so much. I was super excited for this race weekend because I would be running with my great running pal, Jessica and we would get to see her Dad, Steve and her adorable daughter Harper. We had a blast leading up to the race and you can read about that in a previous post. We got to the start area and it was quite warm as we expected. 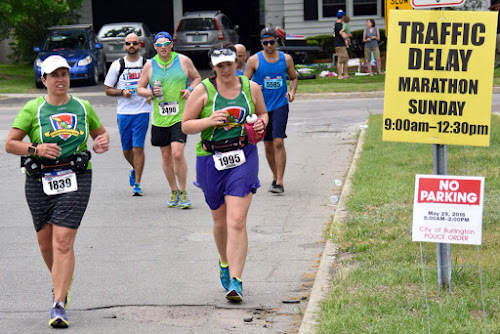 The sun was out and it was humid, but we were smart and we were well hydrated and planned to drink extra at the stops and to slow down our normal pace. We started off by going through downtown Burlington and the crowd support was great. We saw Dave a few times and then headed out on the worst part of the course, the part they billed as scenic and a real treat to run on. It was a long out and back on a boring highway. There was no shade so it was hot. The water spots were far apart and we were surprised they didn’t add more given the conditions. We get to the one on the highway and there is NO water, or Gatorade. This was not good. Jessica and I were lucky and we carry our own bottles and they were still relatively full. Most others were not. I knew at this point that they were not prepared like they said they would be. I have run another hot race, Chicago 2007 and this same thing happened and they ended up cancelling the race. I was worried it would happen here but thankfully the next stop was fully stocked and we didn’t have an issue again. We headed back in to town and saw Dave and his college roommate Duncan and they gave us some orange slices and said we looked a lot better than most people running by them. We were good, we were hot but we were smart and listening to our body. We headed back out of town up a huge hill that took you by the finish line. The sun had gone in at this point and it had actually gotten cooler. We were both feeling good. We got to mile 17 and a fireman got out of his truck and said. "That’s it, the race is called, it’s over" I couldn’t believe it. It was finally cool and why would they cancel it now? We kept going because Dave was up ahead at Mile 18 so we figured if we had to we would get a ride back with him. None of the volunteers knew what was going on. Some said we could keep going, some said they thought the clocks would be turned off, some said the water stations would not be supported. No consistent message at all. Jessica and I decided to keep going because we both felt fine. The spectators were great. They all had hoses going and were handing out water, fruit and popsicles. We weren’t sure if the race would count but we figured let’s keep going. We got to the 20 mile timing clock and mat and it is still on. We got text messages with our times so I thought we would get a finish time. We passed another clock that was still on. We also passed MarathonFoto photographers who were still out on the course taking our pictures. All the water stations were manned and they were cheering us on to keep going. It was a normal race. We were getting towards the finish and we both didn’t feel great at this point so we decided to play it safe and walk a bit more. Dave was great and found us on the course a bunch more times. 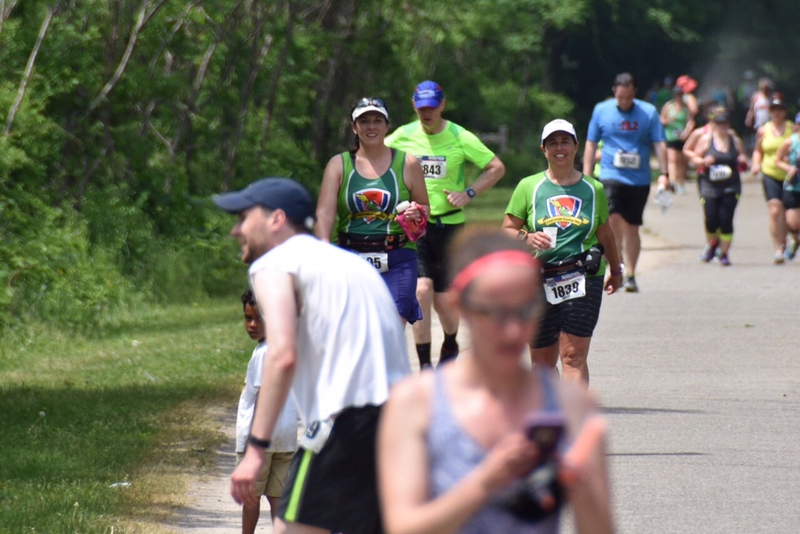 We got close to the finish and could see a thunderstorm was getting close so we picked up the pace. We ran towards the finish line and the clock was still on, again MarathonFoto was there taking our pictures, and we got high fives from race officials. We were texted our finish times. It was a normal finish line experience. BUT it wasn’t. 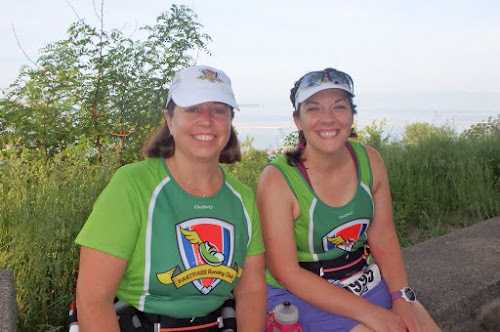 Later that night we found out that the race director decided not to count anyone who finished after 4:30. A time he determined based on when he decided to call the race. He said he called the race due to something called wet bulb temperature. I asked him what the temperature readings were and he said he didn’t remember. What? You cancel the race for the first time in history and you don’t know what the readings are? I have to say I am extremely disappointed in the follow-up and the way this cancellation was handled. When Chicago was cancelled, it was very obvious it was cancelled. The road to continue was blocked off. It was clearly communicated that the race was OVER. That was not the case here and the fact that I have a time and he won’t let it be in the official results is just ridiculous. So now it looks like we have to go back to Vermont to get an "official" result for my 50 states quest. 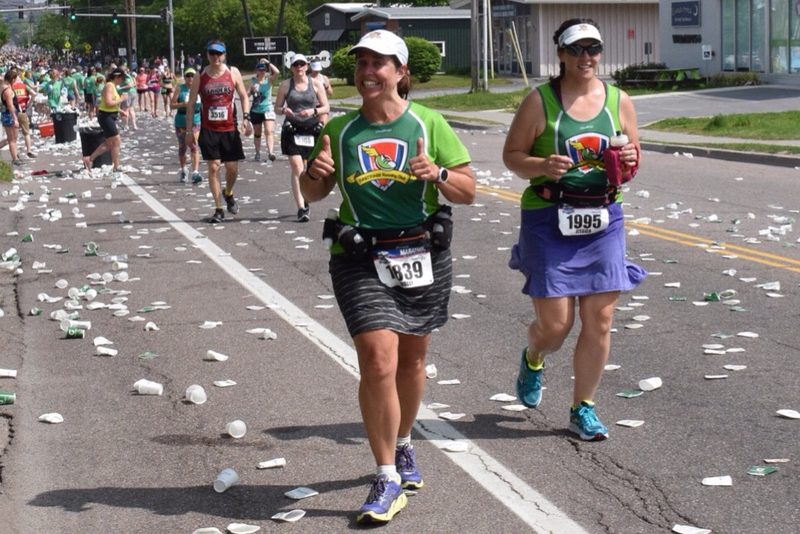 Unfortunately there aren’t a lot of choices in this small state so I may have to go back and do this awful race director’s race again, which will completely kill me. 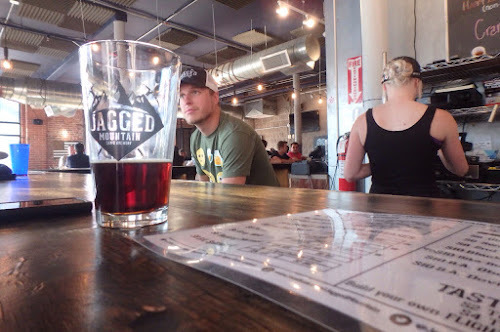 When you are into brewery culture you look for any excuse to visit Northern Colorado. There are so many classic breweries along with new ones popping up almost every month. 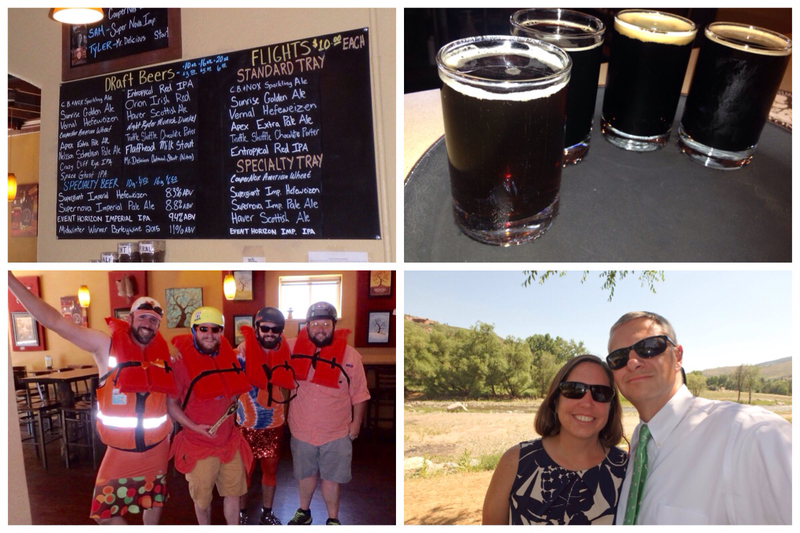 Dave's cousin (the junior bridesmaid at our wedding) was getting married near her home in the Loveland area so we had a perfect reason to do some brewery-hopping. We landed in Denver Thursday evening and spent our first night in the downtown convention center area. It was a 15 minute walk to our first stop: Jagged Mountain Brewing. Their location is in a brick building, which may have originally been a warehouse or light industrial building like many of its neighbors back-in-the-day. This whole section of Denver is under some form of revitalization because of its proximity to Coors Field. The crowd inside was surprisingly more yuppie than hipster. We started off with a flight mixed with wheats, porters, and a black IPA. 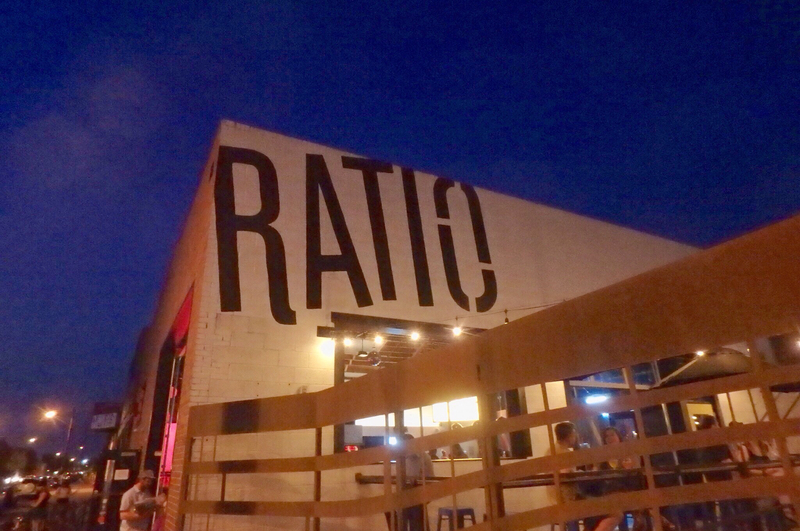 We hung out for full pints and enjoyed a snack of mac & cheese from a foodtruck. 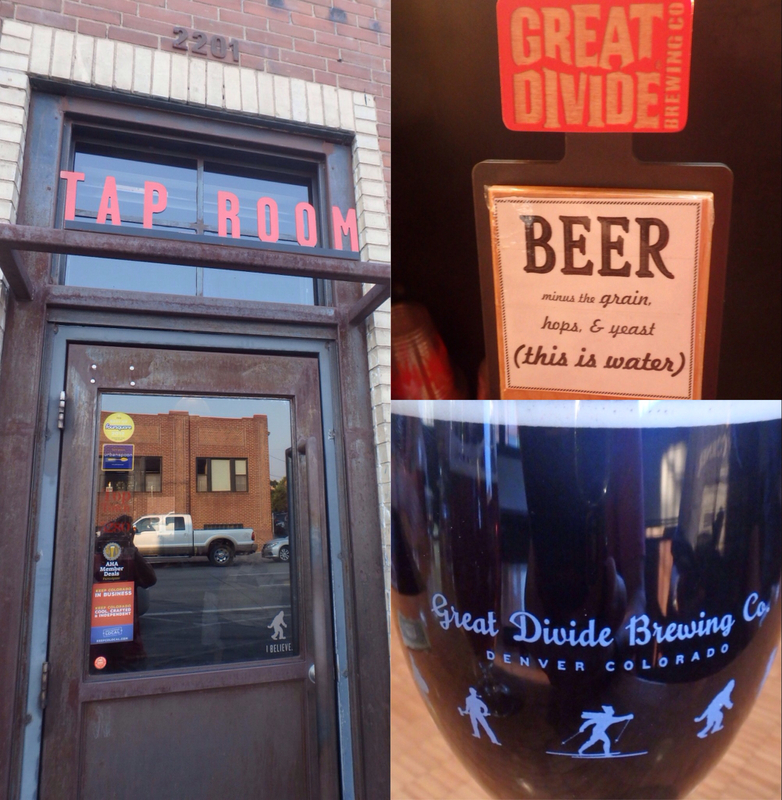 A short walk away was one of the more famous breweries from this area: Great Divide. Their Yeti stouts are very popular (too hoppy for us) but our favorite from Great Divide is their Claymore Scotch Ale. The tap room was nice with a bar area in the front and a few tables/communal areas in the back of the room. We started off with samples first, then moved on to full servings of our favorites. We were getting hungry and the obvious choice in the area would be to go to Breckenridge Brewery's restaurant a few blocks away (been there before). Fortunately for us the couple we had been chatting with at the bar suggested we visit First Draft, also a few blocks away. The area between the two businesses was a little sketchy, but it was still very bright out and traffic on the roads was still steady. First Draft is a concept we'd like to see spread like wildfire across the country (read an article that there are over 300 self-pours in the country). Patrons start by securing a RFID card with their credit card. Then they get free reign to pour their own drinks. 30 taps of beer, wine, cider, and cocktails line one wall. The RFID cards are used to activate the taps and they monitor how much beverage is poured. Drinks are charged by the ounce. 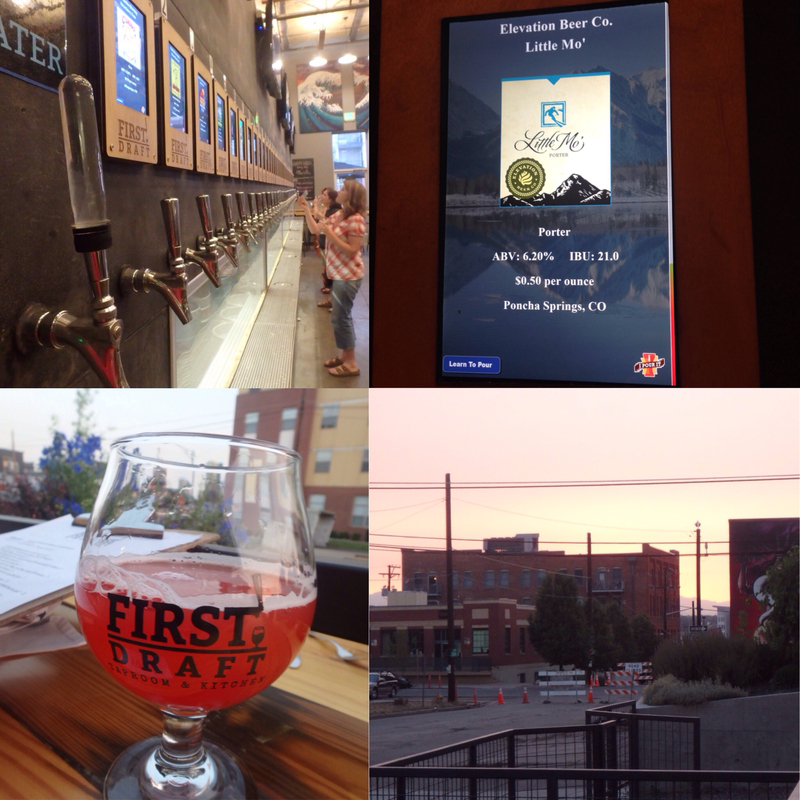 Information about the beer was displayed on iPads. After sampling, we picked some full serving favorites and then ordered food. We split the thai corn cakes and waygu burger. Both were awesome. We decided we could work in one more brewery and walked a few blocks over to Ratio based on Dave's cousin's recco. Sadly we passed a brewery on the way to Ratio an did not stop. 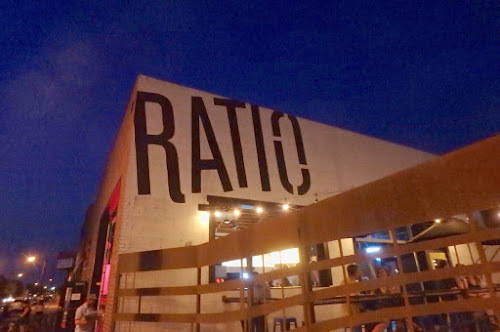 Ratio had a really cool outdoor patio. We ordered two varieties of Scotch Ale - one traditional and one coffee flavored. Quality beers but the coffee one was a bit too coffee-bitter. The next morning our first stop was to Denver's VooDoo Donuts. We loved their products when we visited Portland and had to go out-of-our-way to get them again. 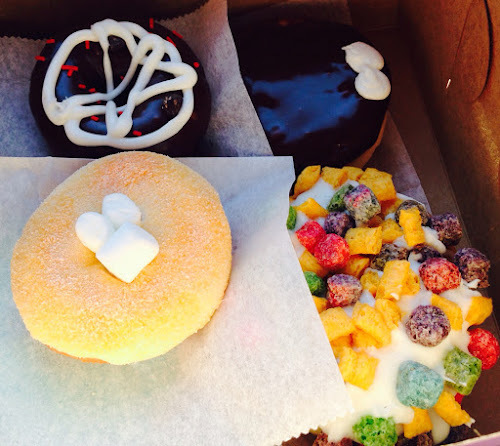 Mental note: donuts topped with cereal get stale quickly. Getting 6 to eat over two days was a little much, but we wanted to try a few different types. Holly enjoyed the one topped with Tang powder. We headed west to Boulder. Instead of visiting a brewery we visited The newly opened Skirt Sports store. It's a women's running clothing store. Dave just plopped on the chair and played with his phone while Holly took the time to try on a variety of items. Good thing we left room in the luggage. Now for some fun! We stopped at Oskar Blues Homemade Liquids and Solids restaurant. Unfortunately it was too early for lunch but all the food that came out looked great. Oskar had about 30 beers on tap including all their own current offerings and guest taps to round out the selections. We were working individual tasters and our great bartender threw in a couple of other sippers for us to sample. We got to try a nice variety of beer. Everyone told us to visit Grimm Brothers in Loveland. Nice place tucked into an industrial park, great bartender, fun games available in the bar, but the beers did not wow us. Dark beers must not have been their niche. Oh well.... After Grimm was time for lunch. We went to Coopersmith's In downtown Fort Collins for a quick bite. Since Dave had more driving to do during the day he tried the homemade root beer which was very good. We met Dave's family and took possession of his dad while his aunt ran errands. We walked a few blocks from Coopersmith's to Patero's Creek Brewing. We had beers ranging from kolsch to wheat beers aged with Swedish Fish to Oreo Porter. Yes, Oreos infused into the beer. We learned about the Brewer's Olympics - a charity event taking place the next day. After attending a pre-wedding picnic we dropped dad back at his hotel and headed back towards our hotel in Fort Collins. Black Bottle Brewing was nearby. They featured their own beers plus guest taps. We had their Peanut Butter Porter and New Belgium's Lychee Tart. Food looked good but we decided having sushi back in our room would be more enjoyable. We had our marching orders on Saturday to be at Dave's aunt's house between 1:15 and 1:30 for pictures. That left us a little free time to walk the streets of Fort Collins and browse some shops. Beyond the breweries Fort Collins really is a nice town/city with a lot to offer. 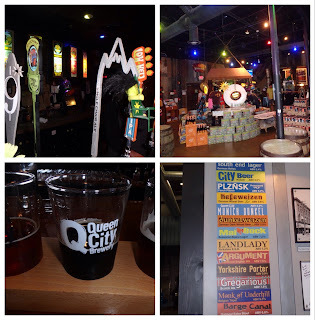 We plotted our course through town to end up at Equinox Brewing around 11am when they opened. We started with samples and enjoyed almost everything we chose. The Brewers Olympics team representing Equinox was getting ready to leave for the event and invited us to join them in a celebratory beer shot. Fun! The bartender allowed us to eat the Subway sandwiches we bought beforehand, which bought us some time to have a full beer. We really enjoyed Equinox - the taproom is very pleasant with a lot of local art and there were plenty of quality beers to choose from. We rushed back to the hotel, changed, checked-out, and made it with plenty of time to spare for photos back at the house. The rest of the weekend was spent with family and at the wedding. June: In June we had our first double-charity month. We supported The Humane Society of the United States and St. Jude Children's Research Hospital with $125 donations each to honor the wishes of a friend's wife that passed away after a long battle with cancer. In our September 2015 Charity of the Month post we told you about our friend Gail and how they discovered she had a brain tumor while preparing her for back surgery. Gail took the challenges of surgery and chemo well and continued to fight and recover. She never gave up and always had a positive outlook. Unfortunately she had an accident recently that caused bleeding in her brain that would be inoperable and she passed away this week. 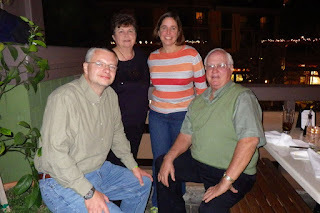 We had a lot fun the two times we met Gail and her husband Jon for dinner in Orange, CA and Disneyland. Gail was a true friend and would do anything for you that she could. She will be missed by so very many. 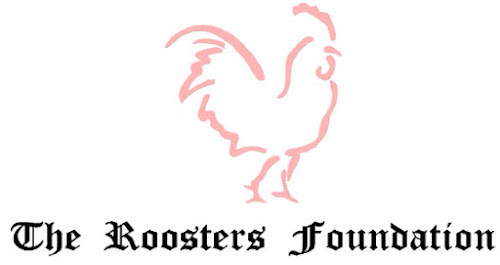 The Roosters is a charity and social organization, consisting of 100 professional men, with diverse backgrounds, from the greater Orange County area of Southern California. Each year, we raise hundreds of thousands of dollars for disadvantaged children. 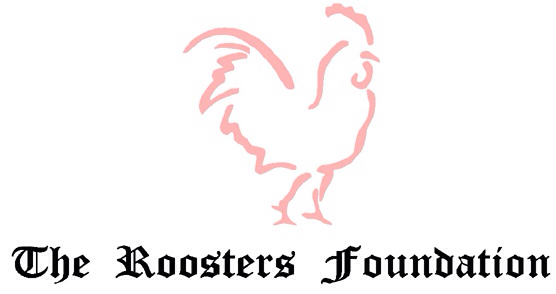 February 2014 marked the 37th year that the Roosters have been active in philanthropy and outstanding community service. We are a 501-C-3 tax-exempt corporation (33- 0764177) that provides a cost effective means of fund raising with marketing advice and support for small, local children’s charities and community groups that do not get national or government funding. Jon heads their annual Food Drive which provides holiday meals for local families in-need. Gail always enjoyed helping with the annual drive and they requested donations in her name to go towards this event. On the donation page the event is noted as "Food Drive Contribution in Memory of Gail Giberson". The donation link is below. We spent our Memorial Day Weekend in New England. 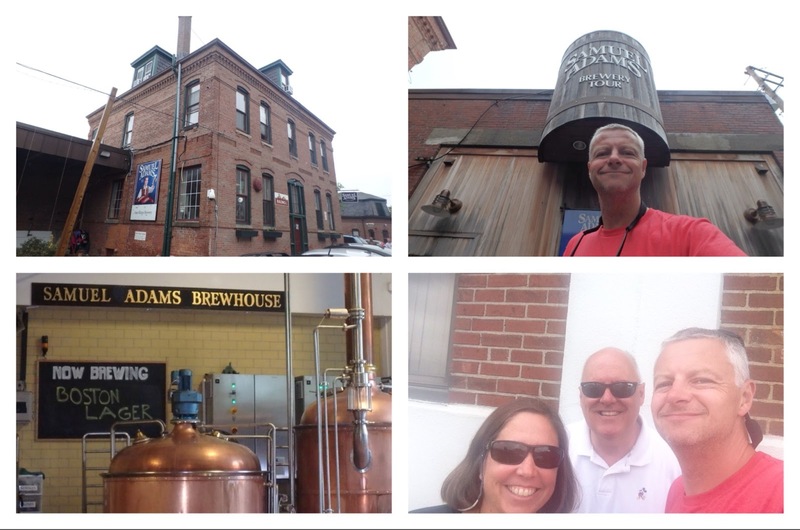 More specifically Vermont, but we did catch a few sights in Boston (two breweries). 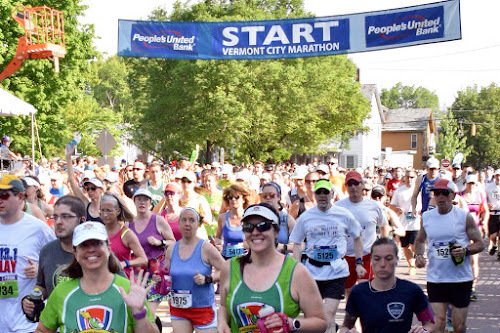 We were traveling to Vermont so Holly could run the Vermont City Marathon in Burlington. That report will be the topic of a future post. In this post, we will focus on all the other activities. 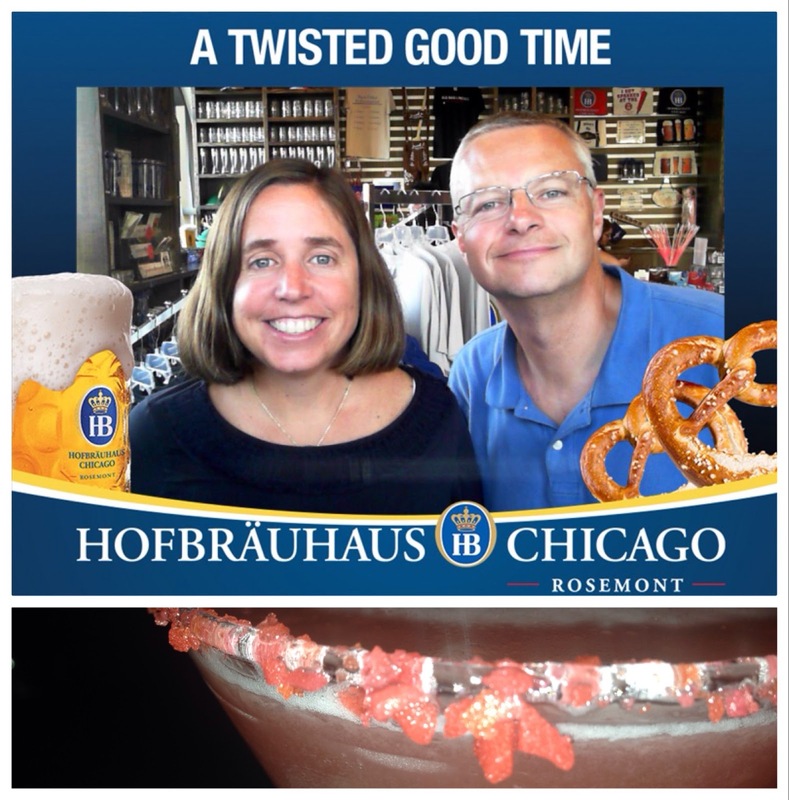 We had an early morning flight to Boston (cheapest option) so we opted to stay overnight by O'Hare at a hotel in Rosemont's Entertainment District. We enjoyed some beers at Hofbrauhaus, then more good beers with dinner at Park Tavern, and a nightcap at King's: a high-end-retro-themed bowling alley. Ever have a Pop Rock Martini? Fun night. The drive from Logan Airport to Burlington was approximately 3.5 hours. We picked up lunch at the New Hampshire rest stop/deli/diner/c-store/discount liquor market. The drive was uneventful and void of things to look at. Every once in a while we did get a pretty view, but overall a tree-lined boring drive. After checking into the hotel we made our way to downtown Burlington. It's a nice college town situated on Lake Champlain. There is a pedestrian mall (like Denver and Boulder) lined with shops, restaurants, pan handlers. This town, again much like Boulder, attracted a lot of hippy wannabes. 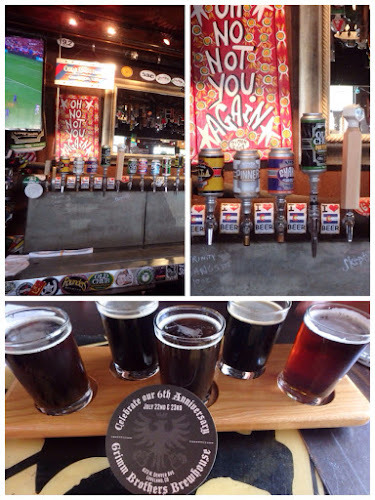 We enjoyed a flight of beers at Vermont Pub and Brewery before we moved up the mall to Three Needs Taproom and Brewery. When we arrived we found they no longer had their own beer available. However, there were many other local options. The one consistent thing that we found is that Vermont supports its local brewers and businesses. 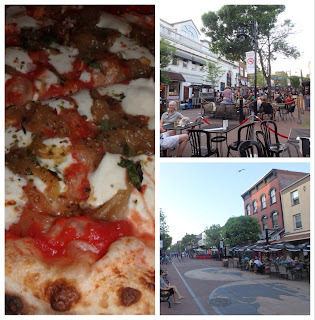 We met Jessica (Holly's race partner), Jessica's daughter, and Jessica's father for dinner at Pizzeria Verita. Oddly enough we saw someone who attended our wedding over 20 years ago at the restaurant. Since she was someone's +1 we didn't say hello. After dinner we went to the mall and listened to a band before returning to the hotel. The race expo was in our hotel so it was easy to get to. 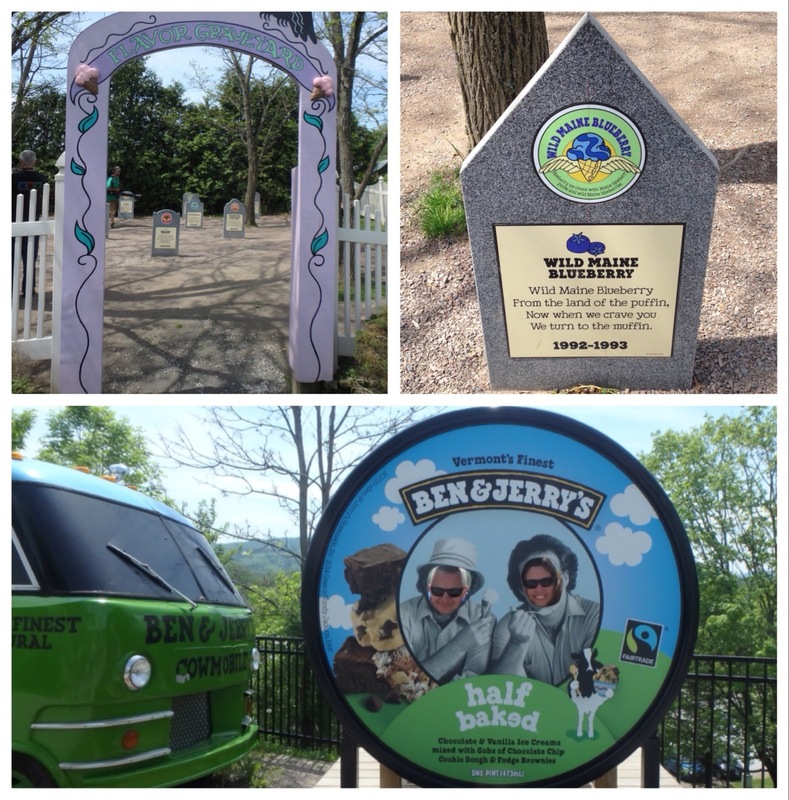 After the expo we took off for the Ben & Jerry's factory tour. We arrived at 10:40 and the next available tour was at 11:10. 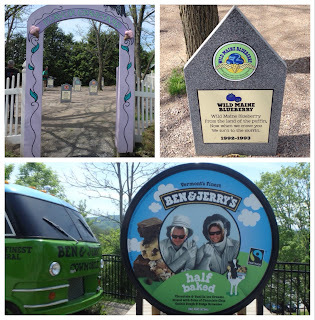 While we waited we bought some ice cream cones and checked out The Flavor Graveyard. Retired flavors each had their own witty headstones. While on the tour we found out that this building was now an R&D facility and main production lines were at other Unilever (corporate parent) facilities. Not as "small time" as the marketing leads us to believe. Our tour consisted of watching two videos, staring at a factory floor (not running) and trying a prototype flavor ice cream. It was an ok experience, but not really worth the drive out of town for this event alone. For some reason we thought going into downtown Burlington for lunch on a beautiful day was a good idea. Traffic in town was awful. We settled in at the indoor bar of Sweetwaters, which ended up being a great spot with really good food and some nice dark beers on tap. 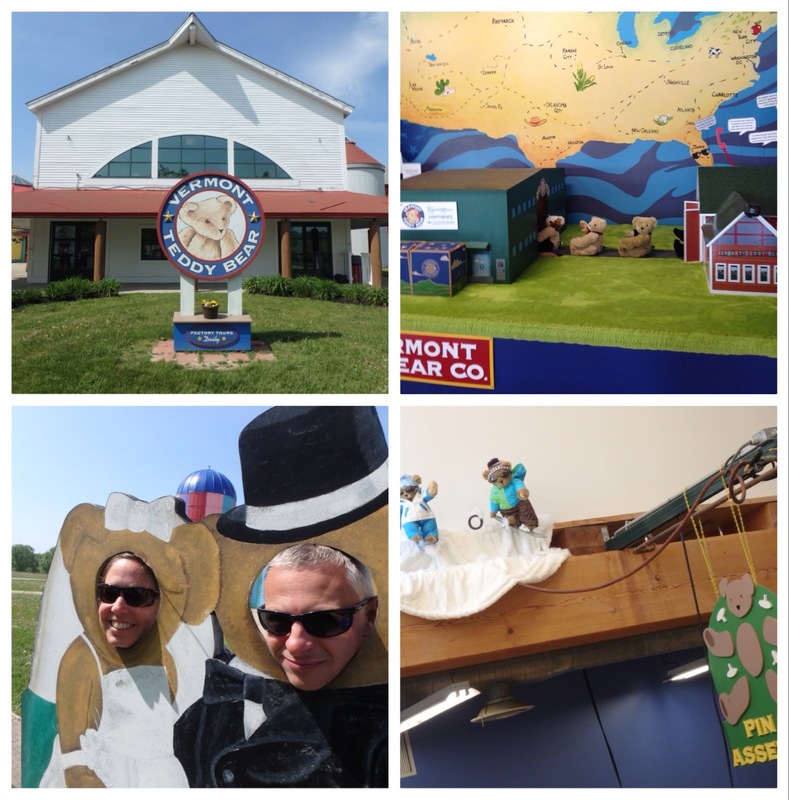 After lunch, we headed south to tour the Vermont Teddy Bear Company. Again, no lines were running on the weekend, but the tour guide walked visitors through the area and demonstrated each stage of the bear-making process. Once we left the factory we headed to Magic Hat Brewing (we actually passed a brewery without stopping to get here). The production brewery had a nice store and tap room. You could not just sit here and order pints. State law allowed 4 free samples per-person. Their counting skills were horrible. 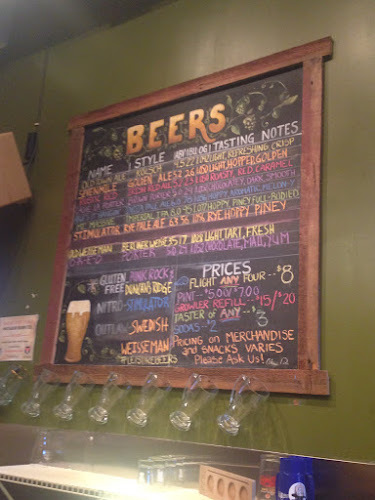 We did find one or two beers we liked (most lean toward the hoppy-side) and we enjoyed the atmosphere inside the store. On the way back to town Dave managed to find the time to stop at Queen City Brewing which was across the street from Zero Gravity Brewing. 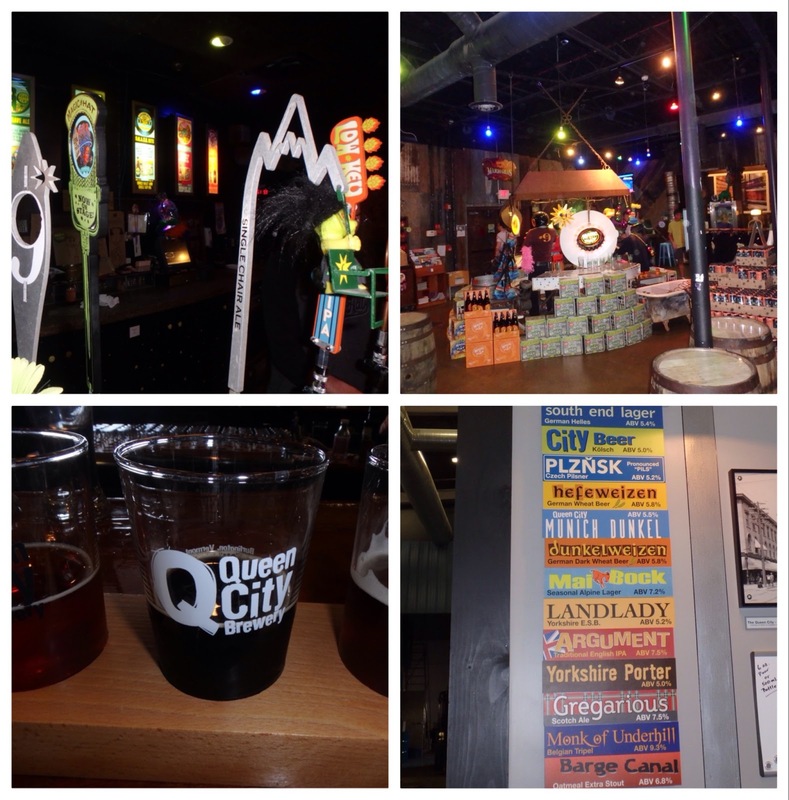 Queen City offered traditional British and German style beers in a nice setting. 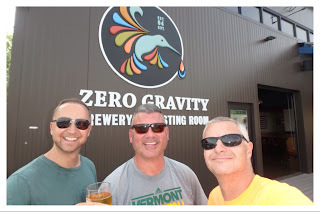 While Holly and Jess were running the marathon, Dave met up with a college roommate at Zero Gravity (fortunately on the race course). They had a nice gose on tap and it was a perfect beer for sipping at 9am. Later in the evening we visited Zero Gravity's Flatbread location and enjoyed brown ales and dunkels. We closed our evening at Nectar's, the place that helped make Phish famous (did not know that until someone told us). It was cleaner inside than expected. Good beer offering and decent chicken wings. Back to Boston the next morning. We decided this was the day to do the Sam Adam's Brewery Tour (it's been on Dave's must-do list for over 20 years). This place is hidden off-the-beaten-path down some narrow streets. We had to wait over an hour for our tour time and the lobby displays only occupied us for so long. Thank goodness for iPhones. The original facility is now a pilot plant and limited edition brewery. Three local bars that supported the brewery in its beginnings get special releases. The tour was well conducted and allowed guests to touch and taste the malt and hops to see the different characteristics. After playing with ingredients and staring at copper kettles we went into the tasting room and enjoyed some generous sampling. We each received a tasting glass to bring home. After Sam's we headed to another favorite - Harpoon. Great beers and only 2-3 miles from the airport. On this day (Memorial Day) the place was packed with every twentysomething living in the area. 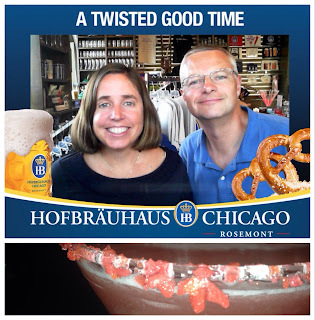 We had just enough time to have a beer and big pretzels for lunch. On the way out we ran into our friend Tom, who just arrived in Boston for a business trip. Amazing how much we were able to cram into the weekend, including a full marathon.